Update: I added a few more pics to the bottom that Kristin sent me....and they include her birthday outfit! Last night, we had a small gathering at our house with family to celebrate Grace's first birthday. Still recovering from Parker's 3rd birthday party (that I have yet to post about! ).....and knowing that last week was going to be my first week at work.....I knew I wanted to do something low key....but still special since it is her one and only first birthday! I still made an invitation because.....I wanted to. 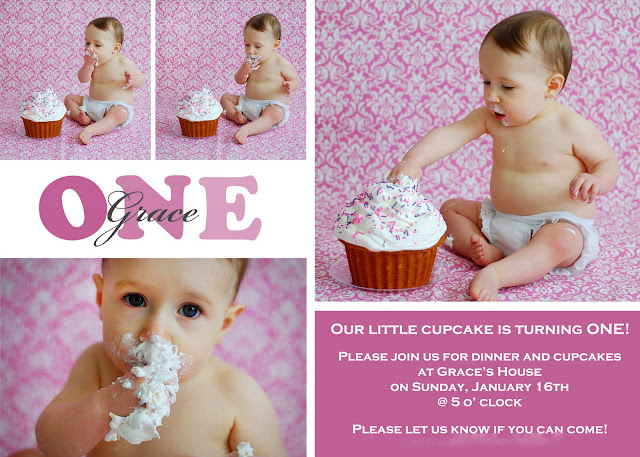 I just thought that she needed an invitation for her 1st birthday party....even if I only invited family (and I had sent them all an email telling them about it a couple of weeks before I even sent it out). We took these pictures a few weeks ago and then I made the invitation in photoshop. My friend, Jenny, had her daughter's second birthday party the day before and she gave us some of her extra tea from Chic-fil-A. Thanks so much! I didn't realize how much I love their unsweet tea! Let me just say before we continue.....that I tried.....and Geoff tried.....we both tried to get so many pictures because we are really bad about getting pictures and functions. And somehow.....we still failed to get hardly any pictures! I don't quite understand it. Luckily, Kristin brought her camera and so I am pretty sure she got a few good ones....but this is it for now....which I am sure is more than enough....but still! We had cupcakes for our little cupcake from Sprinkles. We had 2 different flavors....banana and strawberry. They're my absolute favorite! We had a great time hanging out with our families and celebrating Grace's special day a few days early. It was nice and relaxed and minimal work on our part! Ha! I have to work on her actual birthday, but Geoff is staying home to be with the girls that day. I am trying to think of something 'special' I can do for her since I will only be with her about 2 hours on her birthday. We are giving her this 3-in-1 trike that I want Geoff to put together the night before, but then not give it to her until I get home. Maybe I can bring home a few balloons? Any suggestions for a 1 year old? I guess it's just important that we'll be together. Don't be jealous but Grace and I did get to love on each other a little today! I could eat her up!! Happy Early Birthday Grace!! PS...I have never had a Sprinkles cupcake, but I am pretty sure I might fall over if I had one. They look and sound delicious! 1) I just realized you changed the url to your blog. I like it! 2) Grace looks SO cute in that pink hat. 4) I love the girls tutus. if I must say so myself... We have pretty cute stuff! Grace's tutu, shirt, and bloomers are freaking too cute!! Even cuter in the pictures! And I just saw your new url (bc Amy said) and thats cute! I love the new name of the blog too by the way. Hope Grace has a wonderful 1st BD tomorrow. Enjoyed Sunday evening so very much. Love the new blog and the party pictures. It looks like y'all had a great time. Happy early birthday Grace!